PDF file 1.1 MB Best for desktop computers. mobi file 13.6 MB Best for Kindle 1-3. What conceptual framework could be useful to guide assessing the quality of care for psychological health care within the military health system? What quality measures are available to assess care for posttraumatic stress disorder and major depressive disorder that may be appropriate for the military health system? In recent years, the number of U.S. service members treated for psychological health conditions has increased substantially. In particular, at least two psychological health conditions — posttraumatic stress disorder (PTSD) and major depressive disorder (MDD) — have become more common, with prevalence estimates up to 20 percent for PTSD and 37 percent for MDD. Delivering quality care to service members with these conditions is a high-priority goal for the military health system (MHS). Meeting this goal requires understanding the extent to which the care the MHS provides is consistent with evidence-based clinical practice guidelines and its own standards for quality. To better understand these issues, RAND Corporation researchers developed a framework to identify and classify a set of measures for monitoring the quality of care provided by the MHS for PTSD and MDD. The goal of this project was to identify, develop, and describe a set of candidate quality measures to assess care for PTSD and MDD. To accomplish this goal, the authors performed two tasks: (1) developed a conceptual framework for assessing the quality of care for psychological health conditions and (2) identified a candidate set of measures for monitoring, assessing, and improving the quality of care for PTSD and MDD. This document describes their research approach and the candidate measure sets for PTSD and MDD that they identified. The current task did not include implementation planning but provides the foundation for future RAND work to pilot a subset of these measures. The authors identified more than 500 measures relevant to posttraumatic stress disorder, major depressive disorder, or other psychological health conditions. The authors selected measures according to two validity criteria, two feasibility criteria, one importance criterion, and whether the National Quality Forum had endorsed the measure (a proxy for importance, validity, reliability, feasibility, and usability). The authors mapped the measures to the conceptual framework dimensions, which included the continuum of care and its five phases (prevention, screening, assessment, treatment, and reintegration) and the type of measure (structure, process, outcome, patient experience, and resource use). The authors identified 29 candidate measures of quality of care for PTSD and 29 for MDD. Some are condition-specific; others could apply to other psychological health conditions. The candidate quality measures rely on a variety of data sources, including administrative claims data, medical record review data, and patient survey data. Descriptions of each measure provide a foundation for understanding each measure's content and evaluating its potential value as a means of evaluating the quality of mental health care provided by the military health system. Select a subset of high-priority, feasible quality measures to pilot-test and implement. DoD should consider focusing initial quality measurement efforts on feasible measures that assess high-priority aspects of care at the time of implementation. Consider structured documentation in the medical record to facilitate capturing the data necessary to compute quality measures. Many candidate quality measures rely on important clinical details that the medical record typically documents. Integrating structured documentation into the medical record is one way to potentially increase the breadth and value of routinely captured data. Natural-language processing is another emerging technology that seeks to provide a means for higher-quality data collection without manual medical record review. Pilot-testing and evaluating new approaches to structured documentation and data retrieval are important areas of future research. Develop a process for ongoing assessment of quality of care. A single effort to assess quality of care will be of limited use. Instead, assessing the quality of care for psychological health conditions should connect with ongoing quality improvement efforts, through a continuous feedback loop. As the U.S. Department of Defense continues to pursue strategies to assess the quality of care, it is essential to consider how these efforts will be sustained and what resources will be required to support ongoing quality measurement. This research was sponsored by the Defense Centers of Excellence for Psychological Health and Traumatic Brain Injury (DCoE) and conducted within the Forces and Resources Policy Center of the RAND National Defense Research Institute, a federally funded research and development center sponsored by the Office of the Secretary of Defense, the Joint Staff, the Unified Combatant Commands, the Navy, the Marine Corps, the defense agencies, and the defense Intelligence Community. 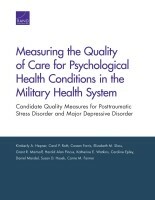 Hepner, Kimberly A., Carol P. Roth, Coreen Farris, Elizabeth M. Sloss, Grant R. Martsolf, Harold Alan Pincus, Katherine E. Watkins, Caroline Batka, Daniel Mandel, Susan D. Hosek, and Carrie M. Farmer, Measuring the Quality of Care for Psychological Health Conditions in the Military Health System: Candidate Quality Measures for Posttraumatic Stress Disorder and Major Depressive Disorder. Santa Monica, CA: RAND Corporation, 2015. https://www.rand.org/pubs/research_reports/RR464.html. Also available in print form.